From left, Coun Russ Wallace; Coun Richard Wearmouth, chairman of Advance Northumberland; Paul Walker, regional commercial director at Tolent Construction Ltd, and Couns Bill Crosby and Malcolm Robinson at the ground-breaking in November. The redevelopment of Bedlington town centre has stalled while final sign-off from the key tenant is awaited, following the completion of ground works. And a warning has been issued that if no word is received soon then other interested parties will be sounded out. Advance Northumberland is leading in the delivery of the major regeneration project focused around the town’s former Tesco site. The Northumberland County Council-owned development company, which replaced Arch, describes the scheme as an ‘opportunity to reposition Bedlington as a retail destination, improving amenities and giving local people greater choice’. Tolent, Advance Northumberland’s appointed contractor, has recently completed an enabling package of works to prepare the site for construction. However, the actual development can only start once the anchor tenant formally commits to the scheme. Despite two years of planning and positive negotiation, final assurance from the anchor tenant is now holding up the development and Advance is working to resolve this as ‘a matter of the highest priority’. Once confirmed, a number of other retailers are already lined up to join the scheme. It is intended the development will move forward as soon as investors are secured to the retail scheme. Coun Richard Wearmouth, chairman of Advance Northumberland, said: “We are of course disappointed to find that our anchor tenant has still not given a commitment to proceed. “The project is central to the regeneration of Bedlington town centre, providing much-needed new retail and amenities for local people. “Unless we receive confirmation from the anchor tenant in the next few days, we will have no choice but to progress discussions with other interested parties. “We have put a significant amount of resources and time into this development and are absolutely committed to delivering this scheme. 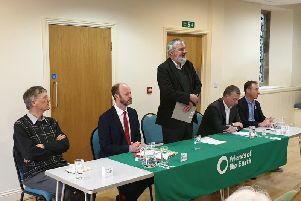 However, these assurances have not managed to ease the concerns of the Bedlington Labour Party, which is concerned about ‘the black hole being left in the heart of our high street’. In a statement, the group said: “Following weeks of rumours and innuendo, Bedlington Labour Party is devastated to learn the Pipers Place project has apparently been put on hold. In the absence of a private anchor investor, the party calls on the council and other public bodies ‘to come together and use their power whether through providing council services or leisure space to underpin the much-needed regeneration of Bedlington town centre’. Labour’s MP for Wansbeck, Ian Lavery, said that he was ‘devastated’ to hear of the scheme being on hold and ‘disappointed that, despite writing several urgent letters to leader of the council, Peter Jackson, I have been left to find out about the failure of this much-anticipated development via the press’. He added that ‘there has been a steady pattern of neglect facing communities within my constituency’ with ‘many vital redevelopment projects being entirely abandoned’ and ‘communities being ignored by the Tories and their allies’. An outline application for a mixed-use development on the site to the north of Front Street was approved in June 2017. The overall scheme agreed comprises a new food store on the eastern part of the site, a family pub/restaurant to the north, a range of retail/commercial units to the west, 12 residential units above the smaller retail/commercial units and around 250 car-parking spaces across the site. Last September, the infrastructure and access elements were approved by councillors along with the details of the first phase – 11 retail units, with frontages at ground-floor level to Market Place, Retail Lane and north towards the main car park, and four apartments at first-floor level off Market Place. This was followed by a ground-breaking ceremony for the multimillion-pound redevelopment, which is estimated will create 180 new jobs plus 70 during construction, in November.